Trucking Forward After the Storms - American Truck & Rail Audits, Inc.
Hurricane Harvey made landfall on the Gulf Coast at the end of August, quickly followed by Hurricane Irma moving in on Florida and Georgia. Now that the hurricanes have passed, FTR Transportation Intelligence has predicted that 25% of Gulf Coast trucking operations will remain impacted until the end of September. Natural disasters and their effects are not new to the trucking industry. 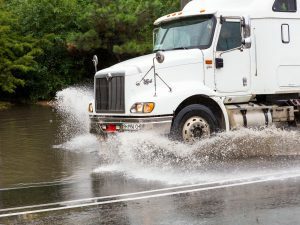 Flooding, a common result of hurricanes, can sideline trucks for days as they wait for roads to become passable, which can lead to an overall increase in prices. Following Hurricane Katrina in 2005, spot prices rose an average of 7% nationally for the next five months, while severe storms in the winter of 2014 led to a 22% increase in those same prices over the previous year. Shipping rates will not be the only ones affected. Approximately 30% of U.S. oil refining occurs in Texas, and weather-related impacts on fuel production can lead to changing fuel prices and shortages. In fact, north Texas experienced Harvey-related fuel shortages within a week of landfall. This is not the first time, nor will it be the last, that Mother Nature will wreak havoc on the trucking industry. America, however, will keep on truckin’. Great piece. This guy sounds like he knows what he’s talking about!